Exclusive Books is delighted to unveil our selection of fiction, non-fiction, cookery and children’s books for our annual Homebru campaign. This year’s slogan is ‘books by us, written for you’ – and the nearly fifty titles on offer represent a highly engaging slice of current South African writing and life, from thrilling speculative fiction (Fred Strydom’s The Inside-Out Man) to on-the-money political analysis (Pieter-Louis Myburgh’s The Republic of Gupta) to bright and captivating cookery and children’s books (Khanyisa Malabi’s Legacy of Living and Sparkles of Taste and Carol-Ann Davids’ The Hair Fair). 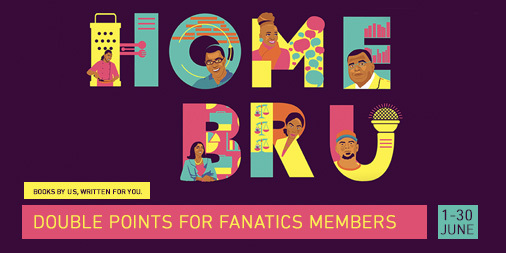 Fanatics members get double points on all Homebru titles from 1 to 30 June. And be sure to keep an eye out for competitions and live author Q&A sessions on our social media. Enjoy browsing the complete 2017 Exclusive Books Homebru selection below.